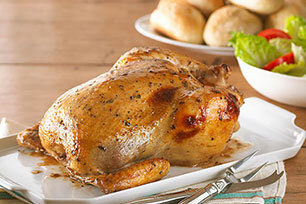 The great thing about roast chicken is its juicy homestyle taste. It’s easy, too, when you follow these simple steps! 1. PREHEAT oven to 350°F. Wash and pat chicken dry with paper towels. Using fingers or end of wooden spoon, separate skin from meat on both sides, being careful not to break skin. 2. BRUSH bottom of chicken with 1/4 cup of the dressing. 3. TUCK wings under chicken; carefully place breast side up on rack in roasting pan. Tucking the wings under the chicken prevents the tips from burning and helps balance the chicken better during cooking. 4. BRUSH or pour 1/2 cup of the dressing under skin and on outside surface of chicken. Brushing salad dressing under the skin helps keep the meat moist and adds flavor, so you won’t even miss the skin if you remove it before eating. 5. MIX carrots and celery with remaining 1/4 cup dressing. Spoon into cavity. 6. BAKE 1 1/2 to 2 1/2 hours or until juices run clear when pricked with knife, and thermometer inserted at thickest part of thigh next to body registers 180°F. Let stand 10 min. before serving, to let juices settle. Remove vegetables before serving. Makes 10 servings.